FILE - In this undated photo provided by the U.S. Fish and Wildlife Service, a Mexican gray wolf leaves cover at the Sevilleta National Wildlife Refuge, Socorro County, New Mexico. The plan sets a goal of having an average of 320 Mexican gray wolves in the wild over an eight-year period before the predator can shed its status as an endangered species. In each of the last three years, the population would have to exceed the average to ensure the species doesn't backslide. Officials estimate recovery could take another two decades and cost nearly $180 million. The U.S. Fish and Wildlife Service considered tens of thousands of public comments - from state lawmakers and business groups to independent scientists and environmentalists - as it worked to meet a court-ordered deadline to craft the recovery plan. It was a long time coming as the original guidance for restoring the wolf was adopted in 1982. Barrett said state wildlife officials reviewed the scientific data and the models used to calculate the best way forward for the agency as it works to bolster genetic diversity and continue building the wild population. 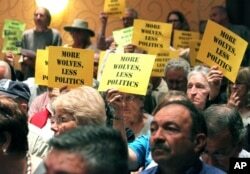 FILE - People hold signs in support of the Mexican gray wolf during a meeting of the New Mexico Game Commission in Albuquerque, New Mexico, Sept. 29, 2015. Barrett said targeted releases of captive-bred wolves and translocations are necessary to make the program work. In an effort to avoid future skirmishes with states, the plan calls for coordination with wildlife officials in New Mexico and Arizona when it comes to the timing, location and circumstances of the releases. They have pushed for years for more captive wolves to be released, but ranchers and elected leaders in rural communities have pressed back because the predators sometimes attack domestic livestock and wild game. Last year, the U.S. Interior Department's internal watchdog said the Fish and Wildlife Service had not fulfilled its obligation to remove Mexican gray wolves that preyed on pets and cattle.